Congratulations to the connections of Arrogate, including ECB client ClearSky Farms, on a great win in the Travers! Race replay of the 147th running of the Travers Stakes won by Arrogate in a track record. Trainer Bob Baffert wins his career first Travers. A huge THANK YOU to High Tide Equine and Tiffany Milne for taking the time to demonstrate the Spa at Gulfstream Park and for the stable tour... we loved meeting all of the incredible horses too! After the horses were done with their treatments, some of us humans decided to give the Spa a try... cold does not even begin to describe the water! SARATOGA SPRINGS, N.Y. -- Racing at the sport’s highest level, the Spa’s signature athletes suffer soreness and tightness just like humans. That’s what keeps Carlos Melendez so busy. "15 or 16, 22 a day. I'm a busy man. 5:30 in the morning until when I am done. That's what I do," Melendez said. Working for 12-time Saratoga leading trainer Todd Pletcher, the 40-year veteran of the backstretch has one job: running the barn’s cold water spa machine. “This is like therapy like the football players get when they go in the ice tub, this is the same thing," Melendez said. “We are just trying to keep the legs cold and tight and make sure we don't have any inflammation," Pletcher said. On this morning, the horse standing knee-deep in the water-epsom salt mixture is Destin, the Belmont Stakes runner-up and third place finisher in Saturday’s Jim Dandy. “Logistics don't allow us to do it with all of them, but we try to do it after their exercise as often as we can," Pletcher said. The Pletcher barn is one of the few with its own equine spa machine. “We decided that we were liking the results of it so we decided to buy our own and it is helpful," Pletcher said. In a sport where results on the track are everything, Melendez looks at the Pletcher team’s run of six consecutive Saratoga titles as proof that his busy days are paying off. "A lot of people don't believe in it but it does, it works and I know so," Mendez said. Seventh Heaven and Seamie Heffernan stole the show by taking the 2016 Darley Irish Oaks at the Curragh Racecourse for trainer Aidan O'Brien. Congratulations to the connections of Divisidero on a Derby Day win in the Woodford Reserve Turf Classic at Churchill Downs! 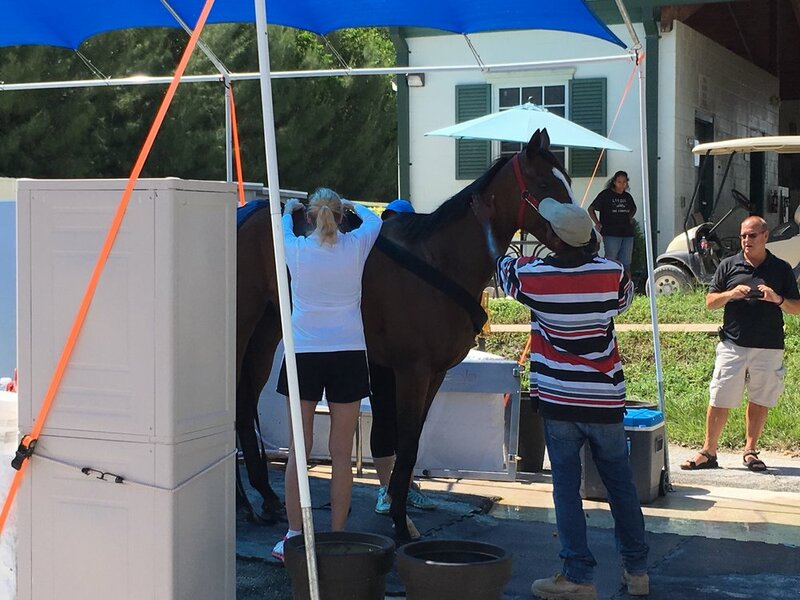 Buff Bradley utilizes the ECB Spas at EquiZone Hydrotherapy with many of his horses in training... including Groupie Doll who was known to frequent the Spa during her racing career. 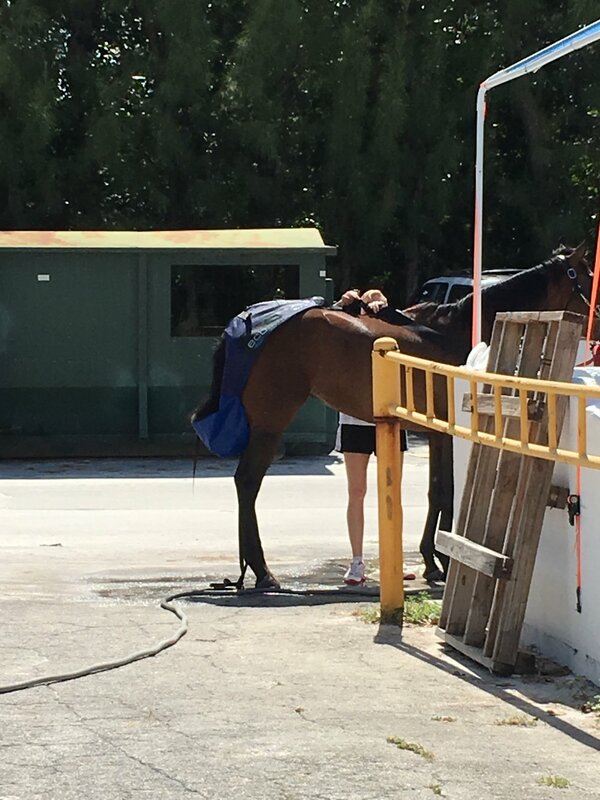 Show below is Divisidero prepping in the Spa the day before the big race. Congratulations to ECB Spa owners Mike Maker and The Ramseys on winning the Miami Mile at Gulfstream Park this weekend with Smokem Kitten! Congratulations to ECB client Todd Pletcher and his team on winning the 2016 Charles Town Classic Saturday at Charles Town with Stanford!